You guys have no idea how it feels to see you guys stop playing with a toy to run to me and grab me once I stand up. I understand that you don’t know whether I’m standing up to leave the house once again or just walking to another room in the house. It hurts me deeply also when you guys cry extremely hard while holding my legs once I walk towards the door to leave. If I could stay, I promise you guys that I would. You haven’t noticed it now because of your age but we have already lived in two different states since you guys were born. It’s a blessing now cause you are getting a chance to know your extended family due to us being closer to Houston. I may be on the road on your birthday but your mom and I make sure I am there for your birthday party. I may have missed a few milestones but videos from mom keeps me smiling to see your progress! You don’t understand now because you guys are only three and one years old but please know that daddy sacrifices his time away from you to make sure your life is better. I was in your position as a young kid also but had it worse. My dad was a young assistant with no restrictions on how many days he could be on the road recruiting. He would be gone almost an entire month sometimes and we didn’t have cell phones with FaceTime or video capability back then. The milestones he missed couldn’t be videotaped for him to see. All of the hours, days, weeks and years of sacrifice led your grandfather to be the first African American Head Coach of any sport at University Of Houston. Those sacrifices he made changed my dad life. It also changed my life and perspective on what I could accomplish. We didn’t have cell phones at all to even call him so I thank God times have gotten better! There are now rules that make sure we have to get off the road and I am able to FaceTime your mom to see you guys. I understand it’s not the same and that’s why you take a peek at me then begin to play like you was before I was on FaceTime. But I am making sure I get a chance to see you grow every step of the way in your life. Please know that the FaceTime would be replaced with physical face time if I could. As a college basketball coach, the ultimate sacrifice we have is time away from our families. Therefore, my biggest sacrifice is being away from you! Never feel that I don’t want to be next to you! You guys mean the world to me and I couldn’t imagine life without you. The time it takes to be successful is very high no matter the profession. I am blessed to be able to get paid to do something I love. I pray and hope that you are able to do the same once you become an adult. I would always wonder as a kid why my dad wasn’t around as much and sometimes would get upset that he wasn’t there. Now I understand that he was on the road recruiting for weeks at a time but would always come see us immediately after coming off the road. I wanted him there with me more then but now I tell him “Thank you” for the ultimate sacrifice to help make sure I had the opportunity for a better life than his. Please know my goal is to make sure that your lives are better than mine. I haven’t seen you guys in five days and just landed in Dallas at 7:45pm. You guys will be sleep by the time I get home but I’ll be ready to see you guys at 6am or 7am when you wake up tapping me on my head no matter how tired I am. I will understand that I have to be at the office tomorrow morning so the time we get before I leave is just as valuable as the short time I get once I get home from the office. Depending on the time of year, I’m blessed to spend four to six hours a day with you guys from the time you wake until bedtime. It’s not a lot but know I cherish every second with you guys! 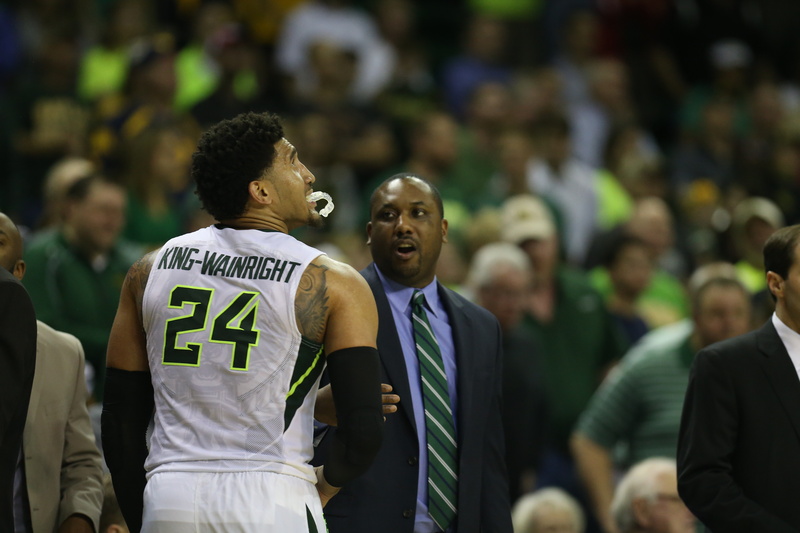 Alvin Brooks III is an Assistant Mens Basketball Coach at Baylor University who is fast rising. He got his start at Arkansas-Fort Smith in 2004. He then spent 1 year at Midland College which has lead to division 1 stops at Bradley, Sam Houston State and Kansas State before landing at Baylor where he currently works under Scott Drew. Please add that AB3 is the only coach in history to win back to back JUCO National Championships with 2 different schools. Truth Jim! He’s is certainly deserving. He’s a stud. One of the best dudes in the business. Selfless, humble, hardworking, conscientious, and a beast is a just brief description of my dude! Loved the read! Man that’s a great article AB3! I definetly can relate with a family as well! Thanks for sharing with us young coaches in the game. Great read bro! Omg! Coach still continues to speak from the heart and not the head. This is a beautiful and inspiring article that not only your children but other children that have parents in your profession can relate to. Your words just May have mended a broken relationship. 😉 Keep God first and keep up the work Coach Brooks! Be blessed! Now that was a dope message. Str8 from the heart. A heartfelt letter from a college friend to his children. Very honored to know him. Men like him deserve to be recognized for being a great example of what a father, husband and role model should look like. Stay blessed Alvin.